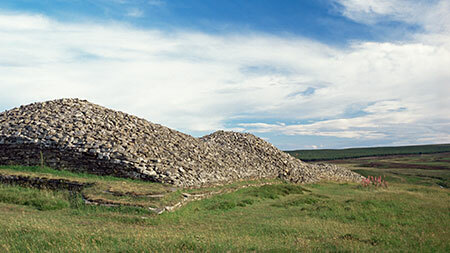 Stand among two of the oldest stone monuments in Scotland – a pair of Neolithic tombs originally built more than 5,000 years ago. Although they have been reconstructed in modern times, the Grey Cairns of Camster provide a fascinating insight into Neolithic funerary practices. The monument consists of a long cairn and a round cairn. The long cairn has two internal chambers and the round cairn a single chamber with three compartments. The cairns are hauntingly sited on a windswept moor, in the middle of the famous Caithness ‘Flow Country’. This lonely location has likely aided the cairns’ preservation, protecting them from the ravages of modern farming.